The team assembles by Structure One for a site resumé by Nick. After the excitement and heavy manual labour of yesterday, Day Two is usually characterised by just heavy manual labour. The metamorphosis of the Ness from black-shrouded ancient to exciting 21st century archaeology is usually neither easy nor quick. But, as Jenna points out below, something surprising has happened this year. Without any apparent acceleration in the work, and certainly no cracking of whips, the removal of the sandbags which are used to bolster walls and sensitive architectural features has gone ahead with remarkable speed. It was helped by the presence of a tracked and motorised wheelbarrow, loaned to us by those nice folk at Historic Scotland. 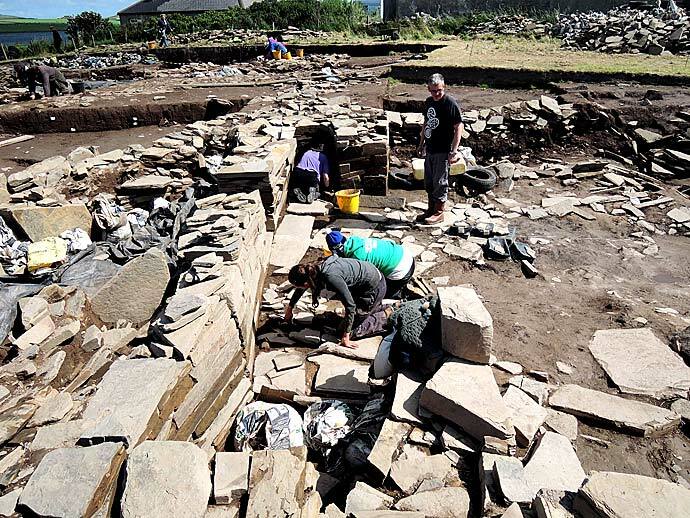 Every year at the Ness produces memorable images and one of the earliest this year is the sight of Colin driving the wheelbarrow loaded with bags and progressing across the site at what can only be described as a magnificently stately pace. The last of the sandbags are removed. The sandbags are, by general consent, disgusting. Many of them were originally containers for fish meal, which doesn’t endear them to the senses in the first place. Years of use have rendered them down to slimy ex-fishmeal bags, filled with greenish-tinged sand, numbers of which have split and dribble their contents onto the ground. Now they are gone, and hopefully forgotten, until that distant time six weeks hence when they will be pressed (literally) into service once more. Nick gave a site tour this morning which was, as usual, interesting for the veterans who hoped to pick up clues about what they might be doing this year, and fascinating for those new to the site who suddenly realised that the coursed stones which they had stared at minutes before had now resolved themselves into Neolithic structures. Site specialists then spoke on their own disciplines. 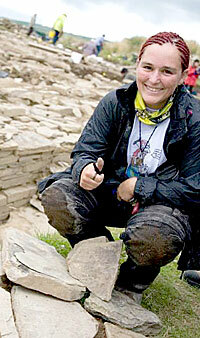 Finds supervisor Anne gave detailed instructions on how artefacts and samples should be recovered, recorded and curated. Anne is the kindliest of souls, but heaven help those who are caught mistreating, mislabelling or generally abusing her artefacts. Martha gives her introduction to the geology of the Ness. Resident geologist Martha described the geology of the site and the interesting rocks which are found on site, many of them brought from others places and carefully worked. 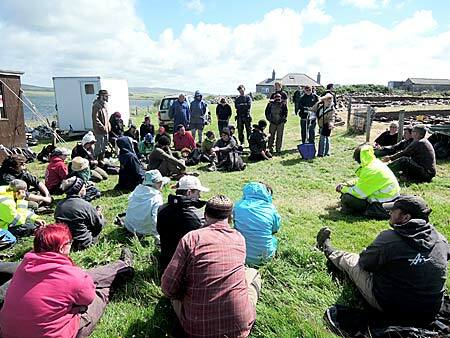 Martha’s work is not primarily concerned with the better-known issues around coarse stone tools but is, rather, aimed at gathering an understanding of how Neolithic people on Orkney interacted with and utilised their natural environment. Much of this, especially the identification of different rocks on site, is novel to even experienced excavators but is certain to open up new and important areas of understanding. Antonia spoke about the remarkable amount of pecked, incised and decorated stone which is found throughout the site, often built into the walls of the structures. Much of her PhD in progress is based on the material at the Ness and this was an all-too-rare opportunity to hear her talk about her subject. Michael Olsson, who is rapidly acclimatising to the Orkney climate after the warmth of his Australian home (he is down to only four layers) also spoke about his work analysing how archaeologists go about their business, and hopefully pointing out ways in which things could be bettered. In most years, the Ness has a good deal of attention from the media and this year is unlikely to be different. 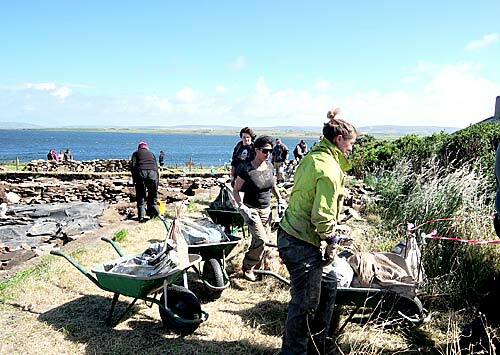 National Geographic magazine has, as readers of the diary in recent years will know, been pouring significant resources into producing a major article on Orkney archaeology in general and the Ness in particular. This will now be published in the August issue, available all around the world, and in this country in hard copy from the end of the month. Filming has also begun for the Digging for Britain programme, which is a sort of video blog following excavations on a regular basis and which is produced for BBC Channel Four. And tomorrow the first of the tours for visitors begins. See you then. The big spring clean starts in Structure Twelve. Hello everyone! My name is Jenna Ward. This is my third year at the Ness; the first two weeks as a student doing the masters excavation module, and then one week as a volunteer. These first few days on site are probably my favourite simply because everyone comes together, new faces and old, and form bonds through intense hard labour that will last a lifetime. This year is no exception as we were able to open the site in just a day in a half. I do believe that is a new record! With the dreaded sandbags removed by hand and wheelbarrows, the trench was completely uncovered by mid-morning. Nick gave everyone a tour of the site and after lunch we were given refreshers on how to record finds, what NOT to take to the spoil heap, and other general site information. 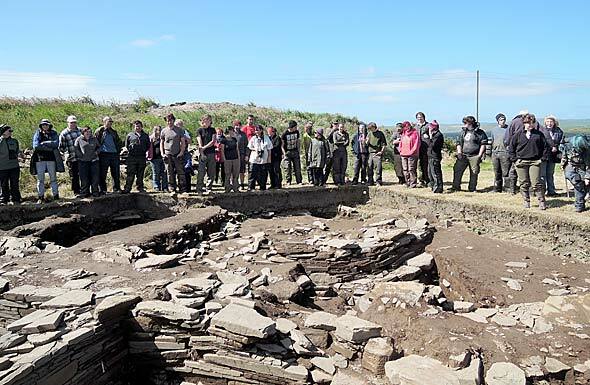 With the site ready to be cleaned, from here on out we are all in the trench, trowels in hand, and ready to uncover amazing things as we continue to learn about the Ness and all its glory. I love being a part of this team and look forward to my time here.